More news from Harry Peralta at Fraser Yachts as he signs the high-performance 42.5m motor yacht Aktobe for sale. 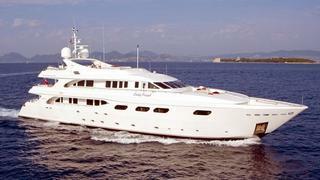 Sold in January 2013 as Lady Feryal and built in aluminium by Cantieri di Fiumicino to a design by Andrea Bacigalupo in 2003, she is ABS classed. A warm and inviting interior features richly coloured fabrics and soft wood finishes with accdommodation for as many as 16 guests in eight cabins including a full beam owner's suite on the main deck. Twin 2,755hp engines give her a cruising speed of 13 knots. Aktobe comes complete with a range of water toys, including a Zodiac tender, Yamaha jet ski, water skis, wet suits and snorkelling gear for all guests. Lying in Palma de Mallorca, Aktobe is asking €8.9 million.